Back at CES in January, Dell announced the next step in personal screen resolution advancements. The recent rise of ‘4K’ (or more accurately, Ultra-HD at 3840x2160) monitors has shown that there is a demand for high resolution interfaces beyond a smartphone. Back when UHD monitors in a 16:9 format launched en masse, prices were high ($3500-5000+) and stocks were limited – I remember back in 2013 testing the Sharp 32-inch 4K display at a vendor in Taiwan several years ago in one of the first pieces to test 4K/UHD gaming. 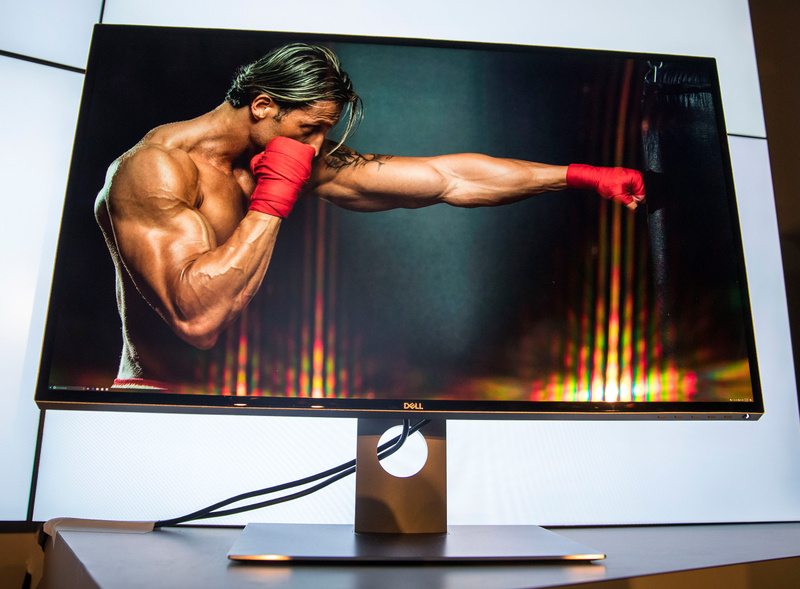 The fact that this was the only UHD monitor that GIGABYTE had in their HQ was a testament to how new the technology was. Now, 24-inch UHD displays can be had for as little as $350. We may see history repeat itself with 8K monitors from today. As always, the first Dell monitors off the production line are designed to be high-end professional monitors. The UP3218K goes in at higher than average specifications, such as 1300:1 contrast ratio, 400 nits brightness, but also offers 100% AdobeRGB, 100% RGB and 98% DCI-P3. The UP3218K is part of Dell’s UltraSharp range, which means we should expect the monitor to be color calibrated out of the box to within a given dE value, typically dE < 3. Naturally a question pops up as to how to hook an 8K display up, especially will all the bells and whistles. The display uses two DP1.4 inputs to provide enough bandwidth, which means that we’re typically dealing with the internal controller stitching together two 3840x4320 displays, similar to how the early 4K monitors did (but with a few more years experience on how to do it). It is possible that Dell supports a single DP1.4 cable, which would most likely use Display Stream Compression 1.2 to offer a visually lossless image as a single panel, however one may suspect that given the target market for this panel, a truly lossless image is probably preferred, even when dealing with two input streams. 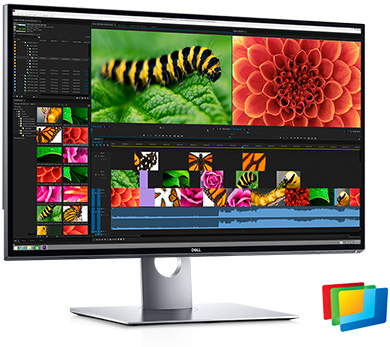 Overall an 8K monitor offers 33.2 megapixels of coverage, which in a 32-inch (31.5-inch) form factor gives 280 pixels per inch. 33.2 megapixels is four times that of UHD, which is 8.3 megapixels. Users wanting to play some AAA titles at 8K on this beast are going to run into walls with memory bandwidth very quickly, however eSports titles should run OK. Using some undocumented tricks, a pair of tests in our new set of gaming benchmarks for CPU reviews can render at 8K or even 16K without needing a monitor, so you might see some numbers in due course showing where we stand with GPU power on this technology. It’s worth noting that Raja Koduri, SVP of AMD’s Radeon Technology Group, has stated that VR needs 16K per-eye at 144 Hz to emulate the human experience, so we're still a way off in the display technology reaching consumer price points at least. From 2013 to 2016, the prices of UHD monitors fell from $3500-$5000 to $350-$500. 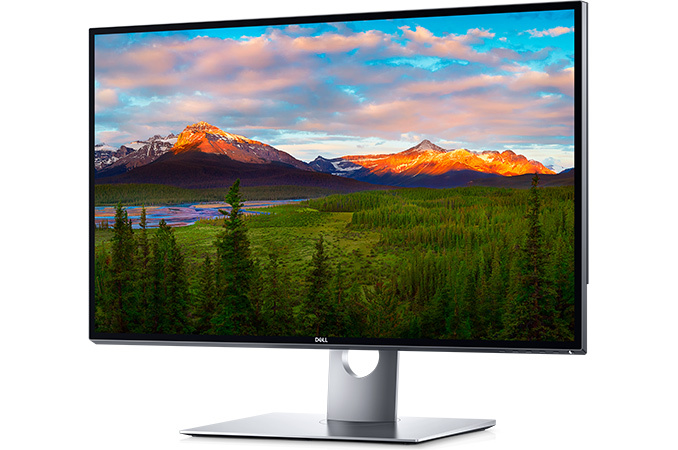 Extrapolating this, users wanting an 8K panel on their desk in a more comfortable price bracket might have to wait until 2020 or so to get one. By then, 16K might exist, back at the $5000 price point. Maybe. Adaptive Sync would be a very good thing for this type of monitor. I'll take the bait. Not only that, but it's a bit small for 8k. 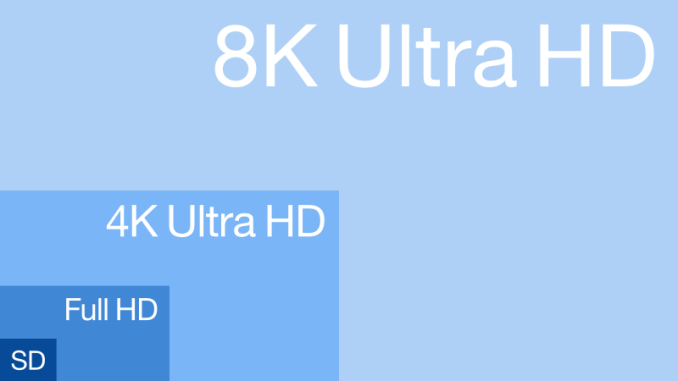 I think 40 -43" is the sweet spot for 4k, so 8k would need to be even larger than that. Why pay for resolution that you can't see?